A variety of Vegetable Soup Recipes with a slight twist for some unique flavor combinations. 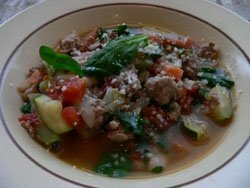 Vegetable Soup Recipes are for 4 servings but are easy to double if needed. This soup is a complete meal. It makes a large enough batch that you can keep leftovers in the refrigerator for a quick and easy meal the next day. I like a little hot bite to this soup so I add a can of ROTEL Hot diced tomatoes with Habaneros. This really heats you up after a good walk on cold winter day. Using a soup pot, cook bacon until crisp and set aside. Drain fat from pot and discard. Brown turkey, and then set aside with bacon. Put the oil in pot along with the onion, celery and carrot. Cook for 5 min and then add water. Continue cooking until water has evaporated. Add zucchini, garlic and parsley. Cook additional 5 minutes and then add tomato, beans, broth, bay leaf, bacon, turkey, salt and pepper. Bring to boil, reduce heat and simmer for 10 minutes. Stir in chopped spinach. Ladle into bowls and top with grated cheese. Wash beans, cover with cold water and soak overnight. Drain. Cover beans with fresh water and bring to boiling. Lower heat and simmer 2 to 2 1/2 hours until tender. Drain and set aside. Melt Butter in large pot. Add leeks, celery, onions and cabbage. Saute for 10 minutes or until vegetables are tender but not browned. Add beans and chicken stock. Simmer 25 minutes. Add parsley. Stir in cream and cheese. Do not boil but heat to serving temperature. Stir in salt and pepper. Saute onion, leeks and celery in heated butter in a 5 to 6 qt pot. Cook until onions are limp. Stir in green pepper. Cook 1 minute longer. Add broth, potatoes, carrots, salt, marjoram and bay leaf. Bring to a boil. Cover and reduce heat, simmer 20 to 25 minutes until potatoes are tender. Stir in milk, parsley and peas. Heat uncovered, stirring occasionally, until soup is steaming hot. Season with nutmeg. TIP: Make your own chicken broth Money saving idea for soup making and you are able to control the sodium amount in the broth. Simmer chicken bones, wing tips, backs and necks in water with chopped onion, carrot, celery, salt and peppercorns, a pinch of thyme and a parsley sprig. Simmer in covered pot for several hours until liquid is flavorful. Strain, cool and freeze in 3 cup containers. Recipes usually call for 3 cups.